Tying the terror fight to economic growth, Pacific Rim leaders closed out an annual summit clouded by worries about the North Korean nuclear crisis — and at least one missile test by the North. The 21-member Asia-Pacific Economic Cooperation forum said it would work to "dismantle fully and without delay transnational terrorist groups that threaten the APEC economies." The joint statement came after President Bush pushed security to the top of the agenda at a summit where others wanted to focus on the official goal of free trade. "If there is no security it is going to be very difficult to have any trade at all," Chilean President Ricardo Lagos told a news conference Tuesday. Mr. Bush failed to win explicit endorsement by the APEC forum for a new U.S.-led diplomatic initiative to end the year-long nuclear standoff with North Korea. The president on Sunday said he would not sign a nonaggression pact with Pyongyang, as North Korea has demanded, but would offer other written security pledges from the United States, China, Japan, South Korea and Russia. The final communique did not specifically mention North Korea's nuclear threat, although U.S. officials said North Korea was alluded to in the call for all countries to "eliminate the severe and growing danger problem posed by the proliferation of weapons of mass destruction." Japan pushed for the final communique naming North Korea with a call for Pyongyang "to take prompt measures to dismantle all of its nuclear programs in a complete, verifiable and irreversible manner." Others including China and Russia resisted the move, diplomats said, and the compromise was to have Thai Prime Minister Thaksin Shinawatra read a somewhat milder statement on the issue. Thaksin urged a "peaceful resolution through dialogue by addressing the concerns of all the parties including the security concerns" raised by Pyongyang. Thaksin said all concerns, including the North's security worries, must be addressed. The leaders called for resumption of multinational negotiations to resolve the North Korean impasse. Chinese President Hu Jintao discussed the crisis privately with Mr. Bush and said he would seek to restart talks including the United States, China, both Koreas, Japan and Russia. North Korea test-fired a land-to-sea missile on Monday as the summit opened, and there was an unconfirmed report that a second missile might have been fired Tuesday as leaders were packing up to leave the Thai capital. Washington accused the North of a provocative act. Elsewhere in their summit-ending statement, APEC leaders said they would better control the production, storage and sales of handheld anti-aircraft missiles that could be used to down civilian jetliners. APEC leaders said they would halt the missiles from going to any "non-state" users, though they stopped short of a complete ban. APEC urged the World Trade Organization to quickly restart talks for a global commerce deal after the collapse of negotiations last month in the Mexican resort of Cancun. APEC reiterated its goal to achieve its own free trade and investment zone, among developed members by 2010 and developing members by 2020 and said it was on track. 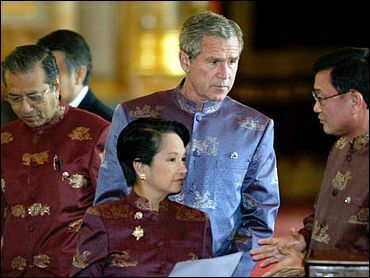 Mr. Bush announced his administration was launching free-trade negotiations with Thailand. But the president came up empty in getting Asian allies to back U.S. efforts to persuade China to end an exchange-rate policy that some U.S. manufacturers and politicians claim is costing American jobs. After the summit's close, Mr. Bush moved on to Singapore Tuesday to meet with President S.R. Nathan and have dinner with Prime Minister Goh Chok Tong. Security was again expected to be at the top of the agenda. The visit to the tiny nation is meant as a public show of presidential gratitude for the support Singapore has given the United States, both in the war on terrorism and the invasion of Iraq, reports CBS News White House Correspondent Mark Knoller. "I'm very happy with the government of Singapore's response to terrorism. They are strong and they are resolute," Mr. Bush said in an interview last week with Channel News Asia. "They understand the task at hand. And they understand the dangers." Mr. Bush was spending the night in the city-state before heading on Wednesday to Indonesia.